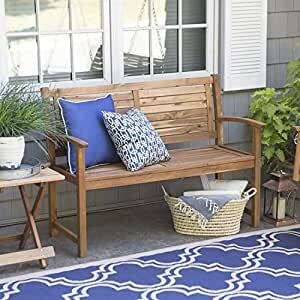 Give any outdoor space a welcome place to sit and take in the sun with this Outdoor 4-Ft Classic Slat Back Garden Bench Patio Arm Chair in Acacia Wood. This bench is made from eco-friendly Acacia wood and features a classic slat back and seat design in a natural wood grain finish. Itâs perfect for any garden path, patio, porch, or deck and adds stylish seating to your outdoor decor. Dimensions: 48L x 25.5W x 36.4H inches. Seat height: 18 inches. 48L x 25.5W x 36.4H in. Seat: 45.25L x 18.25W in.